Smartphone Orthodontics – Patient Self-Scans to Track Hyrax Expansion? Initial Data. Newly published data from a group at Virginia Commonwealth University examines the accuracy of a smartphone app (in which patients scan their own teeth) in making linear dental measurements during rapid maxillary expansion. 12 patients (age 10-17 years, 4 males) for whom rapid maxillary expansion using a Hyrax appliance was planned were enrolled as a prospective cohort. At baseline, the patients were trained in the use of the app Dental Monitoring (Paris, France). Patients all used the same Apple iPhone 6 Plus and the lip/cheek retractors provided by the company for use with the app while capturing video scans of their own teeth. Before Hyrax delivery, at the time of Hyrax delivery, and then weekly during active expansion, each patient made a scan of their own teeth using the same smartphone at the clinic, in a private room away from the study personnel. For comparison, study personnel also scanned each patient’s teeth using the same app and phone at each visit. Alginate impressions were also made at each visit to serve as a gold standard measure, along with intraoral measurements. Only at baseline was an intraoral scan also obtained using an iTero intraoral scanner. Both patients and study personnel captured video scans of the patient’s teeth using a smartphone app at baseline and during expansion with a Hyrax appliance. From Moylan et al. Intermolar and intercanine width measurements were made during the course of expansion using data obtained with the app and compared to measurements made on plaster models. Repeatability of measurements made on the plaster models was high (ICC=0.99). Table 1 Results from Moylan et al. In total, all intermolar and intercanine expansion measures calculated by the app were within 0.5mm of the measures made using plaster casts (Table 1 from Moylan et al). 3 of 58 video scans captured by the app (2 by patient and 1 by study personnel) were judged to be of poor enough quality to not be used for measurements. Although the sample size in the study was small, the fact that multiple video scans were obtained for each participant yielded enough data to draw interesting initial conclusions. 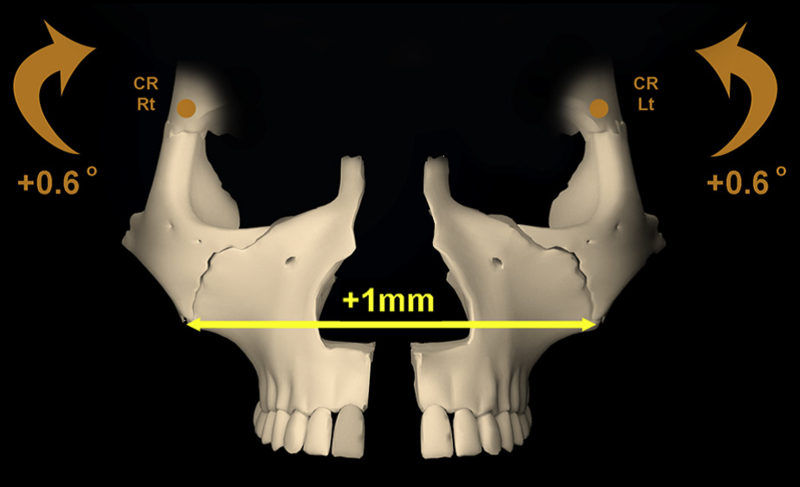 The study was well-designed in that the two linear measurements that were evaluated have great clinical significance in the context of rapid maxillary expansion. Similarly, having all patients use the same phone in a private setting away from examiners was logical for the aim of the study, which was to determine the accuracy of patient-obtained intraoral scans using a smartphone. If patients had used a variety of phones in an uncontrolled setting, more confounding variables might have been introduced. This study is well-placed for the current state of orthodontic practice. If a smartphone app can deliver accurate information regarding tooth position that is clinically acceptable (and 0.5mm was a reasonable threshold in this study), certainly clinicians should be open to the judicious use of similar technology for the best care of our patients. In this case, monitoring Hyrax expansion remotely with fewer in-office visits, might be possible. These data do not suggest that “selfie-orthodontics” is appropriate. They do, however, provide good initial data to suggest that orthodontists might have the opportunity to ethically embrace such technology as another tool to provide optimal care. Article reviewed: Heather B. Moylan; Caroline K. Carrico; Steven J. Lindauer; Eser Tu¨ fekci¸. Accuracy of a smartphone-based orthodontic treatment–monitoring application: A pilot study. Angle Orthodontist. Online 2019. If You Want Good Oral Hygiene in Your Patients, Text Them Every Day: Data from A Randomized Trial. 80 patients being treated at the Texas A&M School of Dentistry enrolled in this randomized trial to test whether daily or weekly text message reminders might better improve oral hygiene. At the start of the study, all patients had been in upper and lower fixed appliances for at least 4 weeks, spoke English, were between the ages of 12 and 17 years, and were more than 6 months from the end of active treatment. Patients (not their parents) received texts through a third-party company that provides such services. In that way, the randomized groups could be blinded from the study authors. Patients received one of three types of text messages: 1) oral hygiene texts (e.g. “Don’t forget to brush your teeth twice a day!’’), 2) shorter treatment time texts (e.g. “Your time in braces will be shorter if you keep your mouth very clean!”), and 3) motivational texts (e.g. “Research shows that a better smile leads to better-paying jobs”). Texting can be a powerful tool for communicating with teenage patients, who have been found to send an average of 100 texts per day. After 8 weeks of text messages, bleeding, plaque, and gingival indices were all measured by a single blinded examiner. All indices were all significantly lower for the daily text group compared to the weekly text. The largest difference between groups was found in the bleeding index, where number of sites with bleeding on probing decreased 48% in the daily group but only 27% in the weekly group. When surveyed, 97% of patients thought that text messages were helpful, and 70% preferred texts in the evening (7-9PM was the most preferred time). In regards to patient preference on texting frequency, 57% reported they preferred text reminders daily or twice a day, while an additional 20% preferred 3-4 times a week. Texts related to a reduction in treatment time were reported by patients to be most motivational. This study was well-designed. The use of a third-party company to deliver the text messages was helpful in two ways. First, it allowed for better blinding; the clinicians treating the patients were not responsible for sending the reminder messages. Second, the use of currently-available technology through this service makes the results more likely to be clinically relevant. Although overall well-designed, there are also a few limitations to be discussed. First, it is always difficult observing oral hygiene in studies due to the Hawthorne Effect – oral hygiene will typically improve to some degree simply because patients are enrolled in a study. Also, the daily messaging group had slightly lower periodontal indices at baseline, although only the plaque index was statistically significant. These limitations likely do not change the validity of the results, but a slightly lower overall improvement may be seen in private practice. Although the use of daily text messages only marginally increased patient oral health, the study was constructed in such a way as to provide helpful data to practicing orthodontists. Nearly all orthodontists already stress the importance of daily compliance with hygiene, elastics, and diet – this study supports those statements and leverages current technology to help support patients in those areas. By using multiple messages and by surveying patients regarding message preference, the results of this randomized trial were made more informative. Importantly, the patients themselves received the text message reminders, and the patients reported their preferences, not their parents. In an age when the majority of teenagers have a cell phone, this aspect of the study design is critical. So, for an orthodontist trying to motivate a teenager in braces, what do these data tells us? For teenage patients in fixed appliances in the US, text messages sent directly to the patient work as a means for improving oral hygiene. Sending texts more often (daily) may be more effective than less often (weekly). The idea that treatment time will be reduced as a result of good oral hygiene is more likely to be an effective motivator than other types of messages. Article Reviewed: Mike C. Ross; Phillip M. Campbell; Larry P. Tadlock; Reginald W. Taylor; Peter H. Buschang. Effect of automated messaging on oral hygiene in adolescent orthodontic patients: A randomized controlled trial. Angle Orthodontist. Online 2018. Click here or on the image below to read A Tribute to Prof.
You can also find A Tribute to Prof on the Think Piece Page, by clicking the link in the navigation bar above.